A power steering hose from a typical hose shop will likely have a 100R5 or similar steel wire braid construction. These hoses are intended for industrial hydraulic applications and are overbuilt for automotive power steering systems. They offer little expansion and transfer noise, harshness, and vibration (NVH) through the system. BrakeQuip high and low pressure power steering hoses have a double braided-nylon design. These high expansion hoses are designed to dampen the pressure waves and improve NVH throughout the power steering system. When a vehicle is designed, the manufacturer or custom builder places the engine, suspension, and steering components within the chassis and then determines how to plumb it all together. This often leads to power steering hoses with long or complex tube forms. BrakeQuip Authorized Dealers have access to a wide selection of braze-on and compression style crimp fittings in multiple tube sizes, allowing a reclaimed or replacement tube form to be used on a new hose assembly. 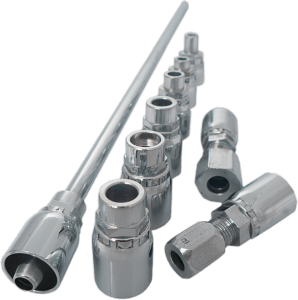 To complete the power steering plumbing, BrakeQuip Dealers also carry popular universal male and female swivel crimp fittings, bump tube adapters, banjo heads, and copper washers. To ensure power steering hoses are quiet and vibration free, BrakeQuip Dealers use PTFE flow restrictors. Our PTFE tuning devices are quick to install and effective at reducing power steering noise.